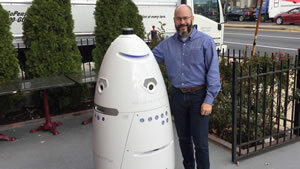 Tim Johnson for McClatchy DC: The security guard of the future is an all-seeing robot, endowed with laser scanning, thermal imaging, 360-degree video and sensors for all kinds of signals. Only, the future is now. Dozens of the self-propelled, wheeled robots are already on patrol in places like the Golden 1 Center arena in Sacramento, a residential development near Tampa, and at venues in Boston, Atlanta and Dallas. They are cheaper than human beings, require no health insurance, never clamor for a raise and work 24 hours a day. They also sometimes do daffy things, like fall into fountains. A Mountain View, California, start-up, Knightscope, contracts out four types of indoor and outdoor robotic sentinels. So far, it has put 47 in service in 10 states.